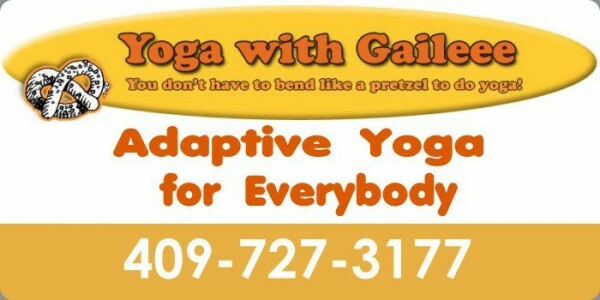 This specialty class is for those new to yoga and dance fitness, people seeking stress reduction, elderly, disabled, pregnancy and those in recovery from illness, injury or surgery, overweight or workers who sit at a desk all day! People of all ages and walks of life with arthritis, fibromyalgia, MS, chronic pain are able to participate. Benefits include: relaxation, stress reduction, flexibility, cardiovascular endurance, mental clarity, strengthening and toning of muscles, improved breathing and more! Everyone needs exercise and everyone can benefit from it. However, not everyone is able to physically to strenuous exercise or standing workouts due to health issues, weight issues, physical limitations. 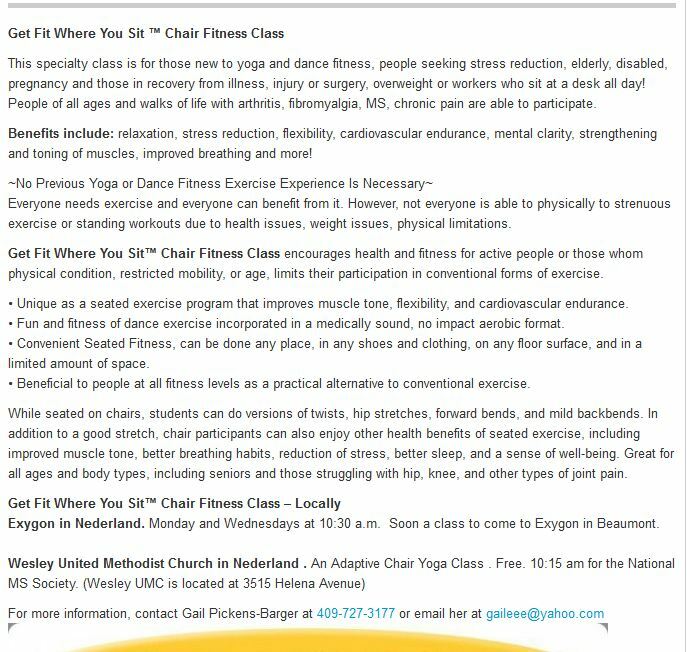 Get Fit Where You Sit™ Chair Fitness Class encourages health and fitness for active people or those whom physical condition, restricted mobility, or age, limits their participation in conventional forms of exercise. • Unique as a seated exercise program that improves muscle tone, flexibility, and cardiovascular endurance. • Fun and fitness of dance exercise incorporated in a medically sound, no impact aerobic format. • Convenient Seated Fitness, can be done any place, in any shoes and clothing, on any floor surface, and in a limited amount of space. • Beneficial to people at all fitness levels as a practical alternative to conventional exercise. While seated on chairs, students can do versions of twists, hip stretches, forward bends, and mild backbends. In addition to a good stretch, chair participants can also enjoy other health benefits of seated exercise, including improved muscle tone, better breathing habits, reduction of stress, better sleep, and a sense of well-being. Great for all ages and body types, including seniors and those struggling with hip, knee, and other types of joint pain. Hope to see you soon in class for this great combination of exercise modalities. Seated Yoga and Seated Dance Fitness!